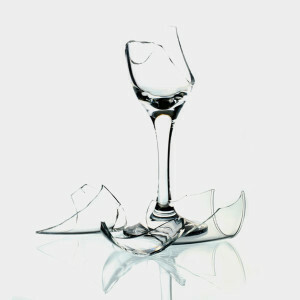 Do not recycle any broken glass item, even glass bottles or jars; broken glass can injure trash haulers and sanitation workers. Depending on the type of bulb, you may need to dispose of it as Household Hazardous Waste. Find out what to do with broken bulbs. Put large pieces of broken glass inside two layers of plastic bags, and then label the bags as broken glass. Set labeled bags next to the garbage. Place small broken glass items in a small plastic bag or wrap them in newspaper. Dispose of those items in the trash.